We work with a lot of technology companies and over the years have come across many “hot new trends” to get stuff done. Some of these are short-lived (remember RUP?) while others linger on longer than they should (waterfall, anyone?). And then there’s Twitter, something I was convinced would be a passing fad. Only it didn’t go away so I jumped on the wagon late and have learned to love it (come follow me on Twitter!). One thing we’ve heard a lot about in the last 5-10 years is Agile. Wikipedia describes agile as software development methods focused on quick responses to change and continuous development. Change and quick – two words I like to see together. And it sounds like life. Many of us probably came into this year hoping to make some changes. Perhaps you even made some declarations or resolutions like: eat more sausage, find the best sandwich in town (oh, that’s just my husband), go to the gym more, floss daily, etc. 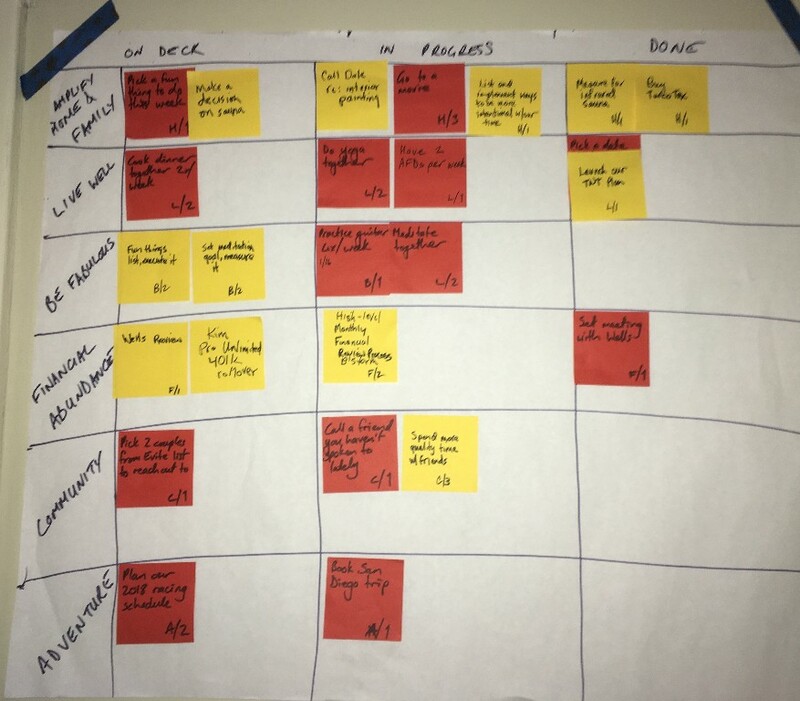 This year, we took the idea of change a bit further and decided to apply agile to life. What if you could realize more of your dreams and have greater clarity about the ones that aren’t real? You know those times when you come across an old journal or list of things you said you’d pursue and then 3 years later (or 30) you find the list again and realize that learning Spanish, working at the Dairy Queen, or creating amazing silk screen art pieces remain unrealized dreams? Most people end up feeling bad for not conquering some of those things. The thing is, there is most likely a reason you didn’t go after those them and it has little to do with having enough time. We all re-prioritize in real-time but rarely do we have an intentional mechanism to see that we have. Agile can help us a lot with that. Last month we set our goals in areas like Home and Family, Financial Abundance, Live Well, and more. You can too, with our article here. For each topic, we identified a list of actions or goals that would take us forward. 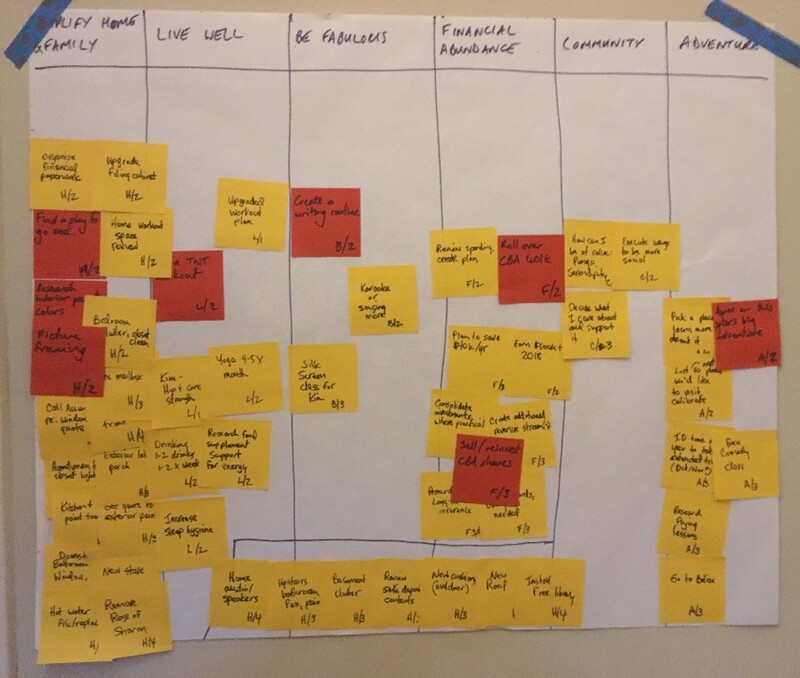 Then we took our ideas, some sticky notes, and a flipchart and our agile life was born! What help is needed or barriers that need to be removed? Are there any items from the backlog that can be brought forward to ‘In Progress’ or ‘On Deck’? Is there anything we thought we would pursue now that we want to return to the backlog or recurring actions we want to repeat? We spend about 20-30 minutes going over our board, celebrating wins, clarifying priorities and finding ways to help each other as needed. We are only a few weeks in but already we see something powerful happening. So far this year we’ve already been getting loads done and feeling more intentional than ever! We launched a high-vitality eating/exercise program, Kim flew to Chicago to visit her Mom, we booked our financial planning review, planned a vacation to San Diego, completed 2017 tax reporting for Kim’s business, took a painting class together, and more. Now, we will both know at the end of a quarter or year what we actually did (we mark those stickies complete) and what we didn’t. Some of our “not done” things will either get done, stay in the backlog, or be removed – all with clear intention. What are some dreams and goals you’d like to accomplish or chores you wish were getting done more routinely in your family without a struggle? Maybe try applying agile to your life. Want more inspiration on Agile (especially if you have kids)? Watch this great Ted Talk on applying agile to family life. I get nothing for these recommendations except the joy of sharing! What’s Your Driving Force? Take this super quick quiz from Tony Robbins and find out here. Steven Covey, author of ‘7 Habits of Highly Effective People.’ He often taught: “there are three constants in life: change, choice and principles.” Find his work here. When we think of vulnerability, most of us think of weakness, an undesired state. In this talk, Brene Brown sheds new light on vulnerability, and the courage it takes.